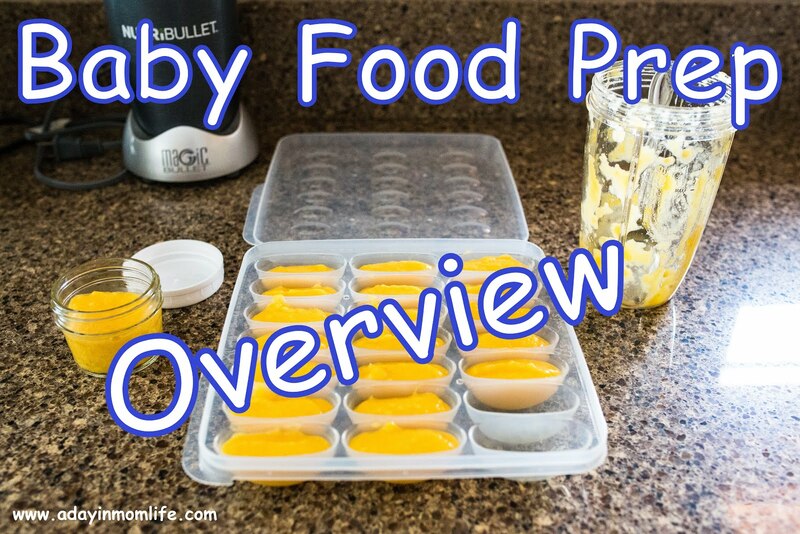 A Day in Mom Life: Baby Food Prep - Overview! Baby Food Prep - Overview! 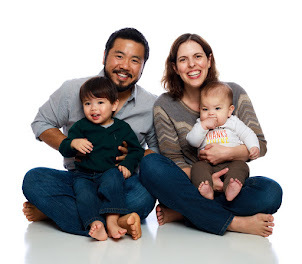 Safe Produce (non-organic) is anything with a thick skin where baby will not eat the skin. Perfect examples are Bananas, Avocados, and Melons. If you are slicing through the skin (like with an Avocado), make sure to wash the produce first as your knife can become contaminated when slicing. Organic Fresh Produce should always still be washed thoroughly and peeled. Examples include sweet potatoes, carrots, bell peppers, green beans, apples, and pears. Organic Frozen Produce is an easy alternative to fresh and just as good. My favorite frozen options include peas, peaches, berries, and chopped kale. Steaming. To steam you need a large pot with a steamer basket or separate insert. I have a large stainless steal pot with steamer basket. I fill the pot with 1-2 inches of water, bring to boil, add the basket, and cover until the produce is very soft. The water level should be enough to cook the produce before it's evaporated off, but not so much that it touches the food. I prepare peas, beans, carrots, etc by steaming. Roasting. Roast in the oven at around 400 degrees. If I'm roasting baby food, I try to also be cooking something for my husband and I at the same time and temperature. You can chop or roast whole sweet potatoes, regular potatoes, beets, or squash. I roast on a cookie sheet or in a glass pyrex dish. Add a little water to the bottom of the pan and/or drizzle on some organic olive oil or butter. Sauteing. Fresh fruits such as apples and pears and frozen fruits such as peaches and blueberries will release liquid while cooking. Add the slices/pieces to a heavy bottom pot (I use an enamel coated cast iron pot) and cook covered on medium low until very soft. If your pot gets dry, add a splash of water. Any blender or food processor will work. I love my Nutribullet! When I was first pureeing food, I tried adding breast milk. But I have a mostly hate relationship with my breast pump and I seldom had fresh milk to use for food prep. Instead, I just add some filtered water. Add only a little liquid at at time, some foods require no extra liquid and you don't want the puree to get too watery. 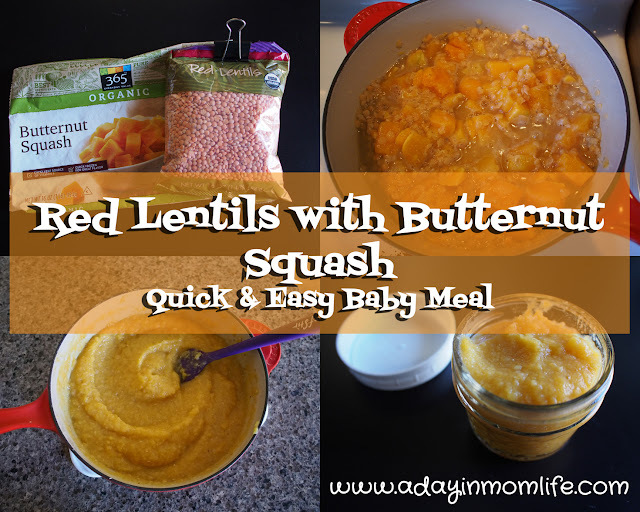 As your baby can tolerate thicker and chunkier foods, puree to a less smooth consistency. An immersion blender is also a great tool for pureeing directly in the pot you cooked in. Mine is similar to the link, but is old and only has one speed, still works fine! Freezing. I absolutely love this Freezing Tray set. These two trays are all I have needed because I only prep one item at a time, making baby food 2-3 times per week. If you want to batch cook a ton of food at once, you will need more freezing trays. The next day, I just pop the cubes out and store them in quart size freezer bags. I mark the bag with the type of food and I used to write the date on the bag, but I go through the food much faster than the recommended 3-month freezer life. I reuse the bag for the same item when I make more because it is already labeled. Fridge. I use standard-mouth Ball Glass Canning Jars in 4 oz and 8 oz sizes. I have a set of 12 each which has been more than enough. 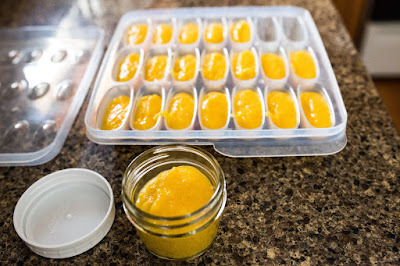 I love that these are glass and Ball also has Reusable Plastic Lids that accompany these jars which are safe for the freezer and BPA-free. I use these jars both to store fresh food in the fridge and to thaw my cubes in the fridge for feeding the next day. Glass jars (see above) are also great for heating up food. I boil water in the kettle and place the glass jar in the hot water in a bowl for a few minutes to warm the food. In a pinch, I will microwave the jar for 10-20 seconds. Make sure to stir and check the temperature before feeding to baby!